If you’re a hunter, a prepper, a homesteader, a chef or a crafter, you probably know at least a few uses for animal fats. If you’re prepping, knowing which fats are best for certain projects will give you even more tools to work with when you may need them. Different animals yield different fat with different textures, melting points and flavors, and thus different uses. Also, some animals carry much more fat than others, so if you’re hunting during a time that you need a lot of fat, you may be able to target higher-fat animals versus their slimmer counterparts. Today we’re going to touch on a few different projects and match you up with animals that provide good fat for your needs. Before you use any fat, you need to render it. Rendering is simply the process of heating the fat in order to separate the liquids from the solids so that you have a usable product that isn’t going to go rancid as quickly as unrendered fat. The rendering process is pretty easy: Make sure that ALL of the meat is removed from the fat, then cut the fat into very small pieces and add it to a skillet or pot over low heat. If you’re working with hard fats such as the fat found in large farm and game mammals, it’s easiest to get the fat really cold and use your cheese grater. You’ll save yourself a ton of time by doing this because large chunks of fat can take days to melt. 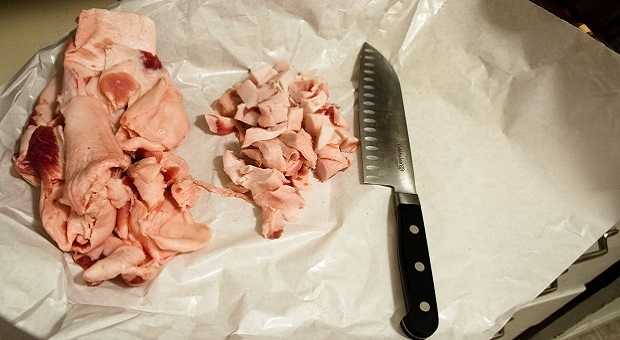 Softer fats such as goat fat and fowl game fat can just be cut into small pieces with a knife. Next, you can choose to dry render, semi-wet render or wet render your fat. The only difference is that dry rendering uses no water, semi-wet rendering uses only an inch or so of water in the bottom of the pot, and wet rendering uses about equal parts of water and fat. Either way, you need to make sure that all of the water is removed by the end of the rendering process or your fat will spoil faster. You don’t want to actually COOK the fat; you just want to get it hot enough to melt. Cooking it on higher heats may cause it to burn (which ruins it) and can make for stronger-flavored fat. Let it melt down until most of the fat is melted and you no longer see little bubbles rising from the bottom – this is moisture evaporating and you want ALL of the water out of it. You’ll have some little chunks of fat and some cracklings left but when you hit this point, you’re done. Remove it from the heat immediately, strain all of the chunks from the fat and you’re finished! Schmaltz is a Jewish delicacy that simply consists of adding onions to your chicken fat during the rendering process. It’s used in a wide variety of dishes to add richness and flavor. Though I’ve never used it, it actually makes me curious to try a variety of herbs during the rendering process to make flavored fats. Hmm. A project for next time, maybe! Just a side note for rendering fat from fowl: toss the skin in along with the fat because there’s a nice layer of fat in it that you just can’t trim off. The skin will just crisp up and you can toss it or eat it if you’d like – it’s delicious. It’s not exactly healthy now, but if you’re in a survival situation, fat is a good source of calories. A solid fat makes for a crisp, flaky pastry but you want to be careful which type you use if flavor matters. Some gamier fats such as bear may add a meaty or gamey flavor to your crust which may be fine if you’re making a savory meat pie. Not so much if you’re making an apple pie. Visceral fats from any animal, the deep fats found around the organs, may best be rendered separately because it typically has very little flavor and is great for pastries. Beef fat, pork fat and goat fat are also great for sweet pastries. If you’re using fat to add flavor and richness, stick with the fat that’s the closest to what you’re cooking. If you’re making a beef stew, break out the tallow. If you’re making chicken soup, toss in some schmaltz. That stuff is like crack in any dish that you want to add poultry flavor to! This is an old Native American food that is packed with fat, carbs and nutrients. It’s made from three primary ingredients and is a prepper’s superfood because it’s easy to transport, it keeps without refrigeration and you can quite literally live off of it if need be. 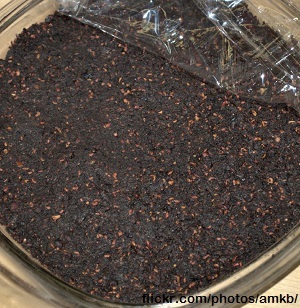 It has fat (typically deer fat but any will do), jerky made from lean meat, and dried fruits and/or berries. You just ball up the ingredients in equal parts and tuck it away. When you’re choosing a fat to deep fry with, you need to consider two things: taste and smoking point. You don’t want to use fats that smoke at lower temperatures. Fats such as butter or bacon grease make them poor choices for deep frying because they smoke at low temperatures. Duck fat is considered a delicacy for frying; you haven’t HAD fried potatoes until you’ve had them fried in duck fat! Other more available fats such as lard, tallow, goat and venison all make good frying grease. Animal fat is typically going to have a lower smoke point than most vegetable oils, just FYI. I’ve tried several different fats for waterproofing and though all of them work, bear grease is by far the best waterproofer that I’ve found. I’m not sure what the difference is but it just seems to provide better waterproofing, especially for my boots, and it seems to last longer, too. Though animal fat goes rancid fairly quickly if not refrigerated, it’s still safe to eat but it tastes like crap. If you have fat that’s gone rancid but you don’t want to waste it, use it to make fire starters. Dip a tampon, a cotton ball or a piece of tinder in the fat and watch it burn! Animal fat gives you a good, hard bar of soap that won’t turn to glop as soon as it gets wet. Tallow (beef fat), goat fat or lard (pig fat) are often used by experienced soap makers. There’s no reason why elk, moose or other large animals couldn’t be used; these three fats are just more readily-available. You can use fats from some plants but the curing process takes months to years whereas soap made with animal fat is ready to use in about 3 weeks. 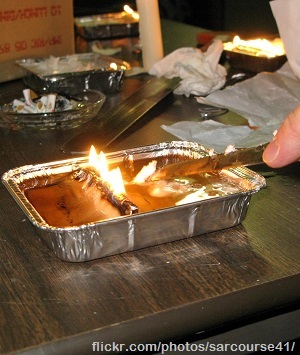 You can use animal fat to make simple, functional candles. They won’t smell pretty but they’ll keep the lights on! Tallow is good for this because it gets good and hard. Lard works but it’s a lot softer. Just place the wick in a jar (I like small jelly jars but use whatever size you want) so that it goes all the way to the bottom, then pour melted tallow in. You’ll need to secure the wick so that it stays in the middle until the tallow gets hard. I use a clothes pin but feel free to use whatever you’d like. The lipids found in mammal fats closely mimic the oils in our skin and people who are getting back to the “old” way of doing things are discovering that animal fats make a great base for soaps, lotions and balms for that very reason. They’re easily absorbed and free of the chemicals and toxins found in commercial products. They also make your skin soft and your hair shiny, though be careful using it on your hair; you’ll have to wash it a few times to get the grease out. As you can see, throwing away the fat from any animal is a shame and a waste. There are a multitude of uses for fat and it’s a valuable resource that you need to learn how to work with in case SHTF. Fat can literally keep you fed, warm and dry while providing you with light. Don’t miss out on it! If you can think of other uses of fat, please feel free to share them with us in the comments section below! Good stuff. I like deep-fried fat, cook it down hard and press for cracklings. At one time, smoked lard (or tallow, drippings from the smokehouse) cost more than good quality butter. when my grandfathers worked in the coal mines, they took SANDWICHES made of fat trimmings from ham and so on, with plenty of mustard. Fat to stay warm, and mustard to prevent cramps. When making pemmican, dried fruit and nuts as well as other things make it tasty. We usually use the meat grinder to cut the fat fine. We only use it for food (tho you can make bio DIESEL from it) because it attracts animals. This article is so basic, and no one talks about it! Thank you. Walk in beauty! of nineteenth century riders as they crossed rivers. I really enjoyed your blog on survival and use of fat. Very informative! I am a Chiropractor, Computer and Electronic Technician, and have been a Big Game Guide at Jackson Hole for elk on horseback. I have been an avid hunter, fisherman, and outdoorsman all my life. I currently live in SW Virginia, but spent many years myself in Sebastian, FL. Have spent much time on the study of survival, edible plants, gardening, prepping, etc. Just wanted to say you are my kind of Women! Can I make soil fertile by adding animal fats to it? like pig fat?